It could have been the perfect crime. 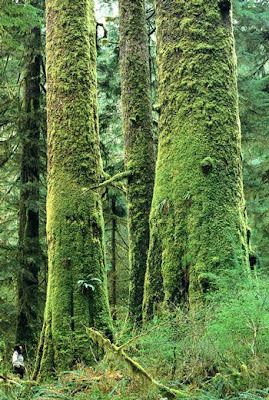 The towering old-growth cedars were on a sliver of national forest land adjacent to Kevin Moran's own property. He chopped the Western red cedars down and dragged them over to his lot before having truckers haul them away. Who, he must have wondered, would be the wiser when the 27 trees disappeared from the forest near Lake Wenatchee? But someone did notice and reported the theft. This week, Moran, a 49-year old Camano Island resident, received his sentence. His penalty for stealing the trees, which were 400 to 600 years old and measured up to 6 feet in diameter, is one year and a day in federal prison, plus a fine. The felony offense carried a maximum sentence of 10 years and a maximum fine of $250,000. Moran was fined $37,688, the trees' estimated market value. He faces three years of supervised probation after serving his time. The sentence was issued by U.S. District Judge Fred Van Sickle in Spokane. "Any jail time that we can get on these timber-theft cases is good," said Anne Minden, a special agent with the U.S. Forest Service. "This was a fair sentence. Of course, more is better, but anything is good." In another tree-cutting case, a woman with property at Lake Tahoe recently was fined $100,000 and ordered to perform community service for paying for the removal of three 80- to 100- year old ponderosa pines growing on national forest land that blocked her view. The Lake Wenatchee trees were stolen in the spring and summer of 2004 and trucked to mills in Western Washington. The crime was reported by a private citizen, Minden said. The lumber likely was exported for sale, she added. Moran was fingered for the theft because he had a vehicle on the property and owned adjacent land. He pleaded guilty last year. Efforts to contact Moran on Friday were unsuccessful. At sentencing, the judge said that given the age of the trees, "it's like stealing part of the history of our country," Minden recalled. Thefts of old cedars and maples are more common on the Olympic Peninsula or in the Mount Baker-Snoqualmie or Gifford Pinchot national forests, she said, and are often done by methamphetamine users, though that was not the case in this situation. The government agency relies on the public -- hunters, hikers, fishermen and others -- to notice and report tree theft. The Forest Service has uniformed officers patrolling the woods, focusing on areas of old growth. Minden investigates about a half-dozen tree theft cases in Washington annually. Article here. Image source here.